Long Beach, California | September 27, 2017–Kontron, a leading global provider of embedded computing inflight entertainment and connectivity equipment, today announced that it has signed an agreement with Air Esurfing, a fully owned subsidiary of Air Media online Group, to jointly explore China aviation Wi-Fi market. The Air Esurfing system solution will integrate Kontron’s ACE Flight™ Server and Cab-N-Connect™ wireless access point for inflight connectivity applications that utilize China’s Ku-band and Ku/Ka-band HTS capacity. Kontron is also providing STC certification services to ensure that the new system is qualified to meet the safety and regulatory standards required for commercial aviation in China. Kontron’s certified IFE&C open platforms were selected for their ability to help reduce the complexity and costs associated with developing next-generation “connected aircraft” systems including new Satcom applications. The new services from Air Esurfing are scheduled to be launched in early 2018 with pilot programs that will offer in-cabin video streaming and inflight Internet connectivity to passengers on China domestic flights. Geneva | February 6, 2017– Airline passengers flying to and from the Ivory Coast can now expect a connected experience, as national airline, Air Cote d’Ivoire (VRE), signs up for inflight passenger connectivity services from world-leading provider SITAONAIR. 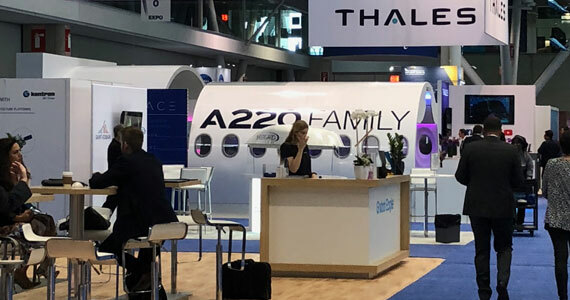 The new deal will deliver connectivity solutions to VRE’s brand new A320s, in the form of SITAONAIR’s Internet ONAIR and Mobile ONAIR products. With Internet ONAIR onboard, airlines can offer passengers seamless inflight internet access, connecting their personal devices by opening a browser – just as they would with a public Wi-Fi hotspot. Airlines can use Internet ONAIR to personalize their passenger relationships by developing a portal that can offer an interactive and engaging experience for the passenger. It also offers opportunities for airlines to grow their ancillary revenues. Mobile ONAIR, meanwhile, offers passengers an airborne mobile phone service that enables them to make phone calls, send texts and use their mobile phone data inflight, through an extensive number of roaming partners in Africa and across the world. In June 2017, SITAONAIR’s teams will begin activating Internet ONAIR and Mobile ONAIR on five new Air Côte d’Ivoire A320s equipped with Airbus’ Airline Network Architecture (ALNA) server platform. The services will make use of SwiftBroadband, an IP-based data service from Inmarsat that SITAONAIR, as distributor, will operate as service provider. The project is set for completion in 2019, when Air Côte d’Ivoire (VRE) will take delivery of the last of the five new A320s. Stephan Egli, Commercial Regional VP for the Middle East and Africa, SITAONAIR, said: “We are very proud to be helping Air Cote d’Ivoire to deliver a brand-new fleet of A320s with the quality inflight connectivity services passengers increasingly demand.